Rascal Flatts and Jason Aldean are the latest artists to join the legendary Lionel Richie on his upcoming country duets album, due in September. Lionel has dabbled in the country music world before, writing Kenny Rogers 1980 No. 1 hit, ‘Lady,’ as well as recording a duet with Alabama in 1987 on ‘Deep River Woman,’ which hit the Top 10 on the country charts. The pop singer-songwriter has already recorded with Darius Rucker (‘Stuck on You’), Tim McGraw (‘Sail On’), Kenny Rogers (‘Lady’), Willie Nelson (‘Easy’), Little Big Town (‘Deep River Woman’), Blake Shelton (‘You Are’) and Jimmy Buffett and the Coral Reefer Band (‘All Night Long’). Sugarland’s Jennifer Nettles and the Zac Brown Band are also expected to be on the project. Taylor Wows Fans on World Tour! Taylor Swift is as all-American as they come, but that doesn’t mean her pop charm doesn’t translate overseas. The talented 20-year-old is in the midst of a world tour, and she kicked it off with a sold-out show at Singapore’s Indoor Stadium. The “Mine” singer’s Singapore fans began arriving for the show a full 24 hours in advance, and Swift rewarded her fans’ patience with a 90-minute set. Now that’s dedication! Her 19-country, 90-show tour continues on Friday with a show in Seoul, South Korea. ongwriters J.T. Harding and Shane McAnally had never met before the day they sat down and penned the smash ‘Somewhere With You,’ which Kenny Chesney has taken to the top of the charts three weeks in a row. Both had experienced their share of trouble and heartache when they collaborated on the song, channeling their frustration and grief into song. At the time, Shane had experienced a breakup at his then-home in Los Angeles and was moving back to Nashville to give Music City a second try after a failed record deal a decade earlier. J.T. was grieving the death of his father, a bad breakup, a lost publishing deal, and the pending demolition of his apartment complex when he showed up on that fateful day for a writing appointment with a writer he’d never met. The result is ‘Somewhere With You,’ a song that instantly struck a chord with broken-hearted fans everywhere. It quickly became Kenny’s 21st No. 1 single and was recently certified gold for sales exceeding 500,000 units. The Boot sat down with J.T. and Shane to hear the inspiring story behind the lyrics. Shane: It was literally two guys who had nothing, and I had just come back. I had no one to write with. I had started playing on the Sunset Strip in L.A. Before I left Nashville, I was just writing what was on the radio at the time, because it was all I knew. And going to L.A., not having anything going on, not having anyone to write with because I didn’t have a deal, that holds you up. You’re gonna find a sound, you’re gonna find your true voice. When I came back, I was driving this ’95 Corolla I had borrowed from my sister’s boyfriend, and a bungee cord was holding up the passenger side window! I ended up writing with J.T. that day because we have a mutual friend who’s a songwriter who pawned me off on J.T., and what a blessing! Shane: What’s funny is the first name that came to mind when we wrote it was Kenny. It was so far-fetched, because everyone says that about every song they write, but it was so different than anything he had done and he always has this side that’s this lost love, the-one-that-got-away thing. J.T. : Shane did a whole tour with Kenny years ago, when Shane’s record was out, so he knows about Kenny a little. One interesting thing about ‘Somewhere With You’ is it’s the same four chords all the way through the song. I really have to credit Shane, because the fast kind of rap-ish part, I had tried that with some other songwriters and they all said, “Well that’s too different, that doesn’t sound country.” And when I sang that melody for Shane, he jumped on it and kept saying, “That’s so different, that’s exactly what we need to do!” And it sure feels good that the biggest artist in country thought it was good for him. Shane: Kenny just took a chance, and we knew the song was good, but I think other people’s reaction is what started us realizing what was happening with that song. J.T. : I don’t know if we knew it was special, but I had recently met Uncle Kracker and his brother, Mike Shaffer, who was managing him. Uncle Kracker and Mike started calling us saying, “This ‘Somewhere With You’ song is really special, we gotta start playing it for everybody!” And with everything else I was going through, it really made me feel good. And Shane, to his credit, made the demo for it, and so much credit goes to him. Also, Shane was really excited that I wasn’t a country writer, that I was more of a pop-rock guy, just as I was excited that he was a country writer. I honestly write songs the only way I know how, to say something I’m feeling, so whether it’s for myself or someone else it’s usually the same. Shane: The reason it works for us as a writing combo is I can get very bogged down in the technical side of a song. The number of words in a line, matching up the rhymes, and J.T. is raw instinct. He stands up off a chair and says, “Right here it has to lift,” and then he’ll sit back down and say, “And here I need to just feel it!” I think he’s more comfortable with me now, he’s climbing the walls now, he’s standing on the edge of chairs, and hanging upside down! What’s my great quote? J.T. : He always says, “You’re scaring people with your enthusiasm!” [laughs] I have to be careful, because Shane has such a great voice that when we’re writing even the most basic idea, it sounds so great when we’re singing it. So I don’t know if it’s good or not. While ‘Somewhere With You’ was sitting on a shelf somewhere, a song I co-wrote for Kracker, ‘Smile,’ came out — I got real lucky with that one — and also the Jonas Brothers single, ‘Feelin’ Alive’. And Shane had ‘Last Call’ for Lee Ann Womack come out, and some Reba and Luke Bryan cuts, so we both had things happening, and we love those things and they’re great, and then out of the blue ‘Somewhere With You’ comes out — the cherry on top. And I personally am a huge country fan, but I would not want anyone other than Kenny Chesney to do this song. Gweneth Paltrow Set to Perform at Grammy Awards! Gwyneth Paltrow will join rapper Cee Lo Green onstage at the 53rd Annual Grammy Awards February 13. Sharing the spotlight with the pair will be the Jim Henson Company Puppets for a “never-before-seen” collaboration. This isn’t the first time Gwyneth has worked with Cee Lo, though. If you remember, Gwyneth performed Cee Lo’s ‘Forget You’ on ‘Glee’ last year and even did a brief duet of the tune with him during ‘Saturday Night Live’ last month. The ‘Country Strong’ actress also joins previously announced nominees and performers Miranda Lambert and Lady Antebellum. The first round of presenters is also out and includes Dierks Bentley, Blake Shelton, pop singers Norah Jones and Selena Gomez and rappers LL Cool J and Nicki Minaj. Dierks is also up for three awards including Country Album for ‘Up on the Ridge,’ and two nods in the Country Collaboration category for ‘Bad Angel,’ with Miranda and Jamey Johnson, and ‘Pride (In the Name of Love)’ with Del McCoury and the Punch Brothers. Coincidentally, Blake is up for Country Collaboration for ‘Hillbilly Bone’ with Trace Adkins. This will be Miranda and Gwyneth’s first performances on the Grammy stage. The 53rd Annual Grammy Awards will air live from Los Angeles’ Staples Center February 13 at 8:00 PM ET/PT on CBS-TV. Nashville is bracing for the return of Garth Brooks next week! The superstar entertainer, along with his wife, Trisha Yearwood, and songwriter Karyn Rochelle, are gearing up to play nine sold-out shows at Music City’s Bridgestone Arena to benefit the ongoing flood-relief effort in Middle Tennessee. Massive crowds are expected to arrive in Nashville beginning Thursday, December 16 — the night of the first two Garth shows — which take place at 7:00 PM and 10:00 PM. Nashville Downtown Partnership is lending a helping hand with traffic control and parking options for fans attending the shows. Fans will have the opportunity to park for free at LP Field for the shows taking place December 16 (7:00 PM and 10:00 PM), December 17 (7:00 PM), December 19 (7:30 PM), December 20 (7:30 PM), December 21 (6:00 PM and 9:00 PM) and December 22 (6:00 PM and 9:00 PM). A shuttle service will be available for $3 (round-trip) for those who wish to be brought from the stadium to the arena where the concerts will be held. There will also be advance parking at the Pinnacle Garage for $10 (plus Ticketmaster fees). Those unable to see Garth in person next week can tune into ‘Larry King Live’ this Friday night (December 10) on CNN. The featured guest for the hour-long show, among topics Garth is expected to discuss are the Nashville concerts and his Las Vegas shows. The wait is over! 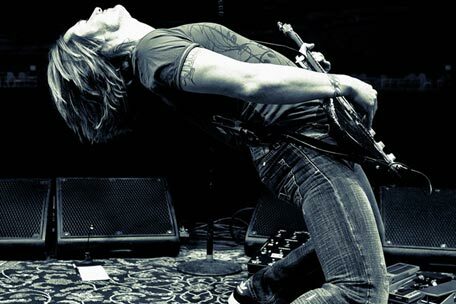 Keith Urban’s eighth studio album, ‘Get Closer,’ arrives in stores this week. The country superstar sent The Boot this track-by-track commentary, sharing his personal thoughts on each song. Read Keith’s own words about each track below. I always like songs that are about the unattainable girl. This guy would never get this girl’s attention in a million years, but he realizes that if he writes a song about her, he could have her in the car all day long and even get to drive her home at night. The concept of her being a song that he would have in his possession was intriguing to me. I come from playing in a three-piece band and this is a loose, Georgia Satellites kind of song. It’s rootsy and cool and it’s got good swagger, and I thought it’d be really fun to play live. It’s just a beautiful, simple thing to say, that I’m ‘All for You.’ I’ve got a real mix of things I love — I love real wedding song ballads, and I love real rocking stuff as well, so I’ve almost always had both of those sides represented on my records. I like to have at least one good summer song on a record. I love radio songs, and there are certain songs that I write specifically trying to hear them on the radio or just in the car. That’s the place I usually have in mind when I write. I still love hearing music in a car more than anywhere. A friend of mine happened upon this song somewhere and called me up and said, “You’ve got to hear this song, you would swear that you wrote it.” And sure enough, it was uncanny how much it was suited to my life. I think if I’d written something like this, I would have felt it was too literal, not poetically disguised enough. Maybe it’s because I didn’t write it that I was able to hear how authentic and truthful it is. I’m the current owner of Waylon Jennings’ guitar. It’s like playing a holy grail. I wanted to use it on some writing sessions and the riff that starts the song came straight out of that guitar. I love the story — it’s unusual for a guy to say those things, like, “What’s happening to me, I’m becoming unhinged, I’m not normally like this.” It’s such strange role reversal, but I really liked it because of that. This wasn’t just a case of recording a song imagining it being played in the car, but actually putting the guy in the car listening to the song. I think there’s a lot of personal discovery in driving, and it can be a very cathartic experience to go on a long drive, having that isolation and time to think. I love cars and driving, and I love touching upon those themes whenever I can in songs. Another take on a relationship song, saying stay in it, don’t run. I didn’t want to do it at first, because I don’t really subscribe to this sort of therapy, I don’t think you should shut out the light and go to bed and say it’s gonna be fine in the morning. When we wrote this song, I remember saying to Monty (Powell), “I get it, and I know a lot of people do this, but I don’t think you should ever go to bed angry.” So Monty said, “Well, then, in the chorus let’s say, ‘Baby, I love you, I’m not goin’ to bed angry- but we’re not getting anywhere, so what should we do? '” I felt better having that disclaimer in there. Carrie Underwood fans will soon hear the singer’s big voice on the big screen, at the end of the upcoming ‘The Chronicles of Narnia: Voyage of the Dawn Treader”‘ which hits theaters nationwide December 10. ‘There’s a Place for Us’ was co-written by Carrie with David Hodges and Hillary Lindsey. The song will be available for purchase exclusively at iTunes beginning November 16. International cover versions of the song will also be recorded overseas in select countries. ‘The Voyage of the Dawn Treader’ is the third film in the hugely popular ‘Chronicles of Narnia’ series. Next week, Carrie Underwood co-hosts the CMA Awards telecast with Brad Paisley on the ABC television network.